Business process management is known as a holistic approach in management which focuses more on aligning all organizational aspects with all the needs and wants of its customers. The entire approach is also more focused on promoting the efficiency and effectiveness of a business while also ensuring that it strives for flexibility, innovation and technology integration. Business process management also attempts to continuously enhance all the essential processes of a business so it is no longer surprising why some experts also call it as process optimization. With the help of business process management certification holders, an organization can be expected to become more effective and efficient while having the ability to handle any changes. This holistic approach is also a major help for organization who strive to achieve higher customer satisfaction, time to market and delivery speed and product quality. It should also be noted that the major goal of business process management is to minimize or fully eliminate miscommunication and human error while also focusing on the specific requirements of the roles of stakeholders. Experts also define this holistic approach as a point of connection between IT departments and line of business. This means that the approach aims to facilitate a better communication between these two areas in an organization. The approach also uses three kinds of frameworks in order for it to effectively perform its functions. These include horizontal framework, vertical framework and full-service framework. Improving your knowledge about these three frameworks is a major help if you want to successfully carry out your task as a business process management certification holder. Brainmeasures is popular for its legitimacy when it comes to providing online certification programs to the public. Because of this, deciding to get your business process management certification from this company is one of the wisest career moves that you can ever take. An advantage of becoming a part of the business process management certification program from Brainmeasures is that you have a hundred percent guarantee that the company can offer you the highest level of training while ensuring that you learn with the help of easy to understand and authentic learning resources. An assessment of your knowledge about business process management is also done by Brainmeasures by requiring you to take an exam. This is a high standard exam considering the fact that it is created with the help of experts. A passing percentage after taking this business process management exam will let you take a hold of your certificate. The business process management certification course offered by Brainmeasures will let you become more familiar about different business processes that you can use when running a business. It covers a wide range of topics and you can view all these after your successful account registration with Brainmeasures. Below is a list of some of the major topics that are covered by the business process management certification program from Brainmeasures. 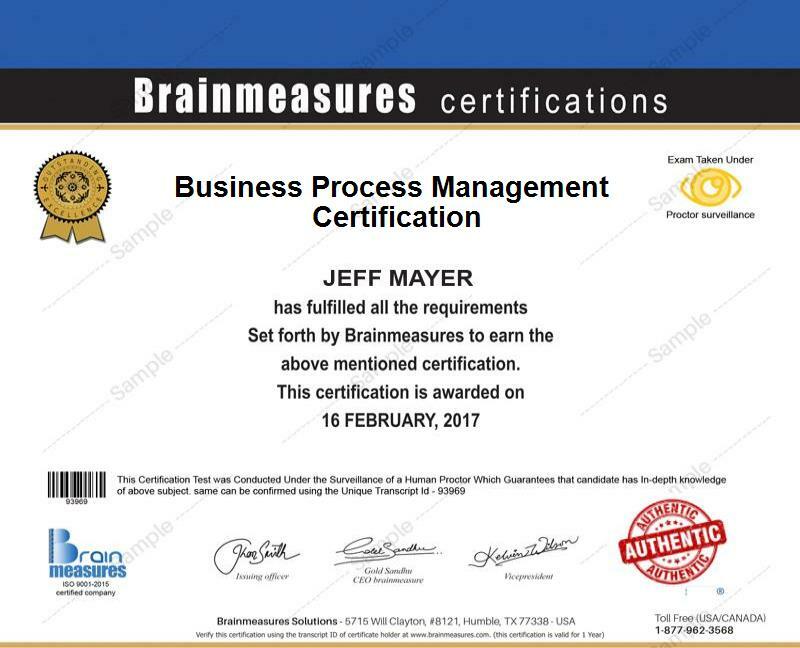 Brainmeasures gives everyone the chance to take part in its business process management certification program so you will notice that there are no qualifications and requirements upon enrolling. Despite that, it is important for you to remember that the program fits perfectly for those who hold managerial positions in an organization and those who often make decisions including business executives, chief process officers, project managers and business process implementers. If you are planning to take the business process management certification program offered by Brainmeasures, then you should become aware of the average annual salary that you can expect to receive after getting your certificate. Business process management experts can actually expect to earn $41,000 to $151,000 annually.